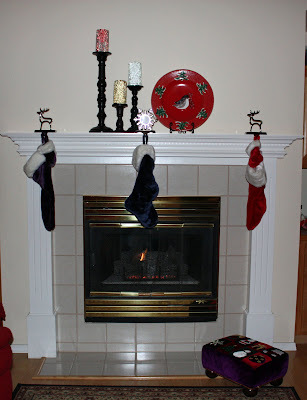 Our stockings were hung by the chimney with care....wishing you all plump stockings today! It's almost time for us to open presents. Me too, I hope for plump stockings this year. You stockings are beautifully hung. Merry Christmas to you and yours! My kids have already ripped through everything! We did have some plump and overflowing stockings here and are thankful for all of God's blessings. Have a wonderful Christmas! Happy holidays to you and yours from Mama, Duncan, Lamont, Leland, Kailey and me in Portland, Oregon, USA.